By Alan Moore, Antony Johnston and Felipe Massafera. Alan Moore, master and magician of storytelling, tears back the veil of one of the most arcane of enchantments -- the Magic of Television. Part grimoire, part grim invocation of things that are all too ordinary, this beautiful 48-page novella is stunningly painted by Felipe Massafera. Maureen Cooper is not real. She is an apparition summoned to screens, into homes, into the hearts and mind of the viewing audience by Carol Livesly. But Carol Livesly is not the god that creates the illusions that capture the mind and bind the soul. She is only a servant of a higher power. A higher, hungry power, as old as the world and eternally new. As, perhaps, are we all... Light of Thy Countenance, an original story by Alan Moore, has been adapted to graphic novella format by Antony Johnston preserving every word, and each page has been painstakingly painted by Felipe Massafera to create this comics masterpiece. Available in a standard Softcover and a limited edition Hardcover, of just 2,000 copies, both with covers by Massafera. 48 pages, Softcover, $7.99; 48 pages, Hardcover, $17.99. By Alan Moore and Jacen Burrows. 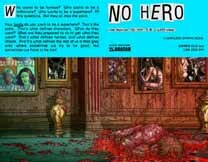 Alan Moore fans, this is the big one, the first all-new Alan Moore horror series in ages is coming, and this is the first look! Neonomicon is the all-new full-color sequel to The Courtyard, and promises to be one of Moore's most discussed works! He takes his re-invention of H.P. Lovecraft's mythos to new levels of madness as investigators look into what happened to legendary FBI man Aldo Sax. The path it leads them down is one of the most intense and disturbing works Moore has ever written. The series itself does not launch until Fall 2009, but this special book offers a look inside the huge amount of material that has already been completed. Featuring completed pages from #1, a look at some of Moore's original script, special design sketches, and an all-new interview with Jacen Burrows, this is far more than just a preview book. It is a glimpse inside the mouth of madness at the hand of the master. Two editions are available: the standard cover by series artist Jacen Burrows and also a special Leather cover by Burrows that are also signed by the artist, packaged with a Certificate of Authenticity, and limited to just 3,000 copies! 16 pages, $1.99 (Leather/signed, $9.99). By Garth Ennis and Jacen Burrows. 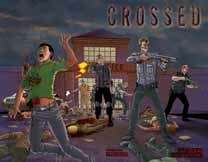 Garth Ennis has pulled out all the stops to write the most twisted book of his career, Crossed. Already a nightmare, things take a turn for the horrifying worst as Cindy's party encounters their deepest fear, a group of Crossed that are hunting them. Tired, hungry, and low on all supplies, now they face a clever bunch of the most evil S.O.Bs you can imagine. Nothing is going right, but this is no fairy tale -- there are no magic cures on the horizon. When civilization crumbles in one terrifying moment; when people are gleefully breaking into unthinkable acts of violence all around you; when everyone you love has died screaming in agony: What do you do? There is no help. There is no hope. There is no escape. There are only the Crossed! This stomach-churning vision is brought to vivid (and more than a little disturbing) life by Jacen Burrows. This third issue is available with a Regular or Wraparound cover by Burrows as well as a rare Red Crossed Edition featuring a striking Black, White and Red cover by Burrows. By Warren Ellis and Ivan Rodriguez. 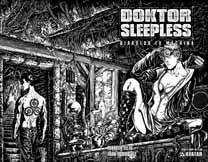 People are hunting Doktor Sleepless. There's a journalist on the streets trying to unpick his skein of lies and half-truths. There's a killer on the streets who wants to save the world from him. There's an old colleague with a gun who wants to ask him some questions. There's Grinders waiting for him to tell them what to do, there are people wondering why their city seems to be falling apart around them and looking for someone to blame... and no-one's seen Doktor Sleepless in weeks! Police Commissioner Preston Stoker, watching his city burn, has to wonder -- what is the mad scientist out to destroy everything planning now? The issue is available with a Regular cover by series artist Ivan Rodriguez, or Wraparound cover by Raulo Caceres, and also a rare Future Warning Sign cover. By Warren Ellis and Juan Jose Ryp. The Front Line are under attack from terrible forces they can barely see, at the same time as they seem to be falling apart from within -- and caught in the middle is idealistic new member Josh Carver, still traumatized from his transformation into a superhuman, still coping with the fact that The Front Line may not be the team of heroes he thought it was. Someone is hell-bent on revenging themselves on The Front Line -- and Josh Carver is next! This fierce fifth issue pushes the action to the limit and is available with a Regular or Wraparound cover by Ryp as well as a rare Design Sketch Edition featuring the initial character designs by Ryp. By John Russo, Mike Wolfer and Fabio Jansen. In 1968, the film Night of the Living Dead redefined modern horror. 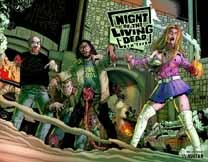 Now, writer John Russo unleashes the next chapter in the zombie epic: Night of the Living Dead: New York! This special, self-contained, double-sized tale of unrelenting terror details the attack of flesh-eating ghouls on the unsuspecting populace of America's largest city, as the island of Manhattan becomes an inescapable death-trap. Mistakenly thought to be contained in remote, rural areas, the army of the undead has crept through the night, converging of the largest concentration of fresh meat on the East Coast, and with nowhere to run and no hope for escape, all those in the path of the zombie horde face certain, gut-ripping death as undead, cannibalistic murderers stalk the streets of the city that never sleeps! This gut-wrenching story is available in a range of covers including Regular, Wraparound, and Gore covers by Mike Wolfer, a Painted cover by Matt Busch, a Rotting cover by Jeremy Rock and a special Premium edition featuring the original movie poster from the 1968 classic film! 40 pages, $4.99 (Premium Edition, $5.99). The undead live on this stunning Art Print from painter Matt Busch measuring 11" x 17". This is strictly limited to only 250 copies, all signed by the artist! Every copy of this art print ships in a special rigid sleeve with a Certificate of Authenticity.